School of Mind-Body Medicine Chair Donald Moss is attending the ISNR meeting in Dallas this week, where he will be teaching a competency course in heart rate variability biofeedback and a workshop on ethics and professional standards in Neurofeedback. Dr. Moss will report in on relevant scientific programs at ISNR. Today Lorenzo Cohen, PhD, provided a keynote presentation on the relevance of dietary, exercise, and life style changes for cancer prevention, and a review of current research on mind-body practices for cancer. Dr. Lorenzo Cohen is Professor and Director of the Integrative Medicine Program at The University of Texas/MD Anderson Cancer Center and Distinguished Clinical Professor, Fudan University Cancer Hospital, Shanghai, China. 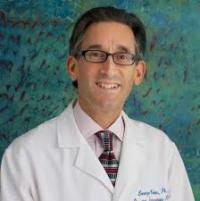 Dr. Cohen is a founding member and past president of the international Society for Integrative Oncology. Dr. Cohen has two close Saybrook connections. Dr. Lyn Freeman, former longtime faculty in integrative health at Saybrook, collaborated with Dr. Cohen on her National Cancer Institute study of guided imagery interventions for breast cancer patients, and Werner Absenger, a PhD student in the School of Mind-Body Medicine, recently completed a research practicum with Dr. Cohen’s team at MD Anderson. Dr. Cohen sees the future of cancer treatment as individualized treatment. There will not be a silver bullet or a single treatment for each cancer. There is not one form of breast cancer but many. We need to individualize care in future, based on the individual patient. We need to turn off the fuel that feeds the cancer — the nutrition and life style factors that feed the cancer tumor growth and the proliferation of metastases. Dr. Cohen emphasized the value of nutrition, whole nutritionally dense foods, especially fruits, vegetables and high-fiber foods, rich in phytochemicals. He observes that these foods provide more benefits than isolated nutritional supplements in preventing various cancers. He emphasized foods with anti-oxidant qualities and anti-proliferative qualities, which evidence shows inhibit the risk of recurrent tumor in breast cancer and prostate cancer. Cohen also emphasized remaining physically active; he cited a study by Holmes et al in the Journal of the American Medical Association in 2005, which showed a clear and direct relationship between activity — being active — and cancer. More activity is better in avoiding cancer, sedentary lifestyle raises risk for recurrence. He cited a study by Barbara Anderson and colleagues in Cancer in 2008, which followed 227 patients with breast cancer for 11 years, and provided approximately half of them with a comprehensive program of stress management, health behavior change, and psychological support. This life style change group showed a remarkable rate of recurrence-free survival, compared to the group receiving standard care. Cohen also cited a new study in Lancet (2013) by Dean Ornish, showing that participants in a life style change program actually produced a lengthening of telomeres, which is an indication of longer term health and resilience. Avoid cancer risk behaviors such as tobacco use and excessive alcohol use. Achieve and maintain a healthy weight. Eat a healthy nutritional diet. Dr. Cohen and the researchers at MD Anderson are also currently conducting a wide range of NIH-funded randomized controlled clinical trials examining the bio-behavioral effects of many contemplative mind-body practices aimed at reducing the negative aspects of cancer treatment and improving quality of life. This research includes studies of meditation, Tibetan yoga, Patanjali-based yoga, Tai chi/Qigong, and other behavioral strategies such as stress management, and expressive emotional writing. Cohen gave credit to a current post-doc researcher in his lab, Dr. Sarah Prinsloo, for initiating a new stream of research using Neurofeedback and LORETA guided biofeedback to reduce chemotherapy-induced neuropathic pain and improve quality of life in cancer patients. The study will map the effects of Neurofeedback training on brain function, and attempt to correlate any pain reductions with specific changes in brain activity. Research in this direction will show skeptics the neuroscience basis of mind-body interventions.